Two weeks ago, we lost a dear member of our family. Barkley came to live in our home 13 years ago, at the tender age of six months, from an animal shelter in Kokomo, Indiana. She became protector, guardian and playmate for then-3-year-old Tyler, who decided to name her Barkley, when his first choice for a moniker – Barocorolli – didn’t fall too well on the parents’ ears. 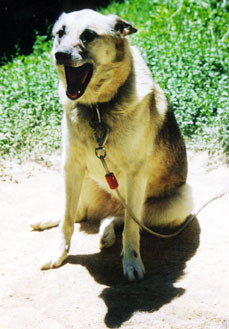 Throughout the years, the husky-shepherd-wolf-mix became a joyful member of our family, holding a dear place in our hearts. She loved to eat pizza and howled when Rodney or the boys played the harmonica, when the moon was full, or critters crept nearby. She welcomed attention with a big smile – yes, she smiled – and loved to have her chest scratched, even up until the moment she died. On Tuesday, June 13, we received a call at work from Tyler, our oldest, who said Barkley just wasn’t acting right. When Rodney went to check on her, we surmised that she had a stroke the night before. The following day, June 14, with the vet’s agreement that it was the right thing to do, Barkley entered into her eternal rest, to shake the arthritis, the stroke, and the chains of her earthly existence to run the hills with her tongue flapping in the wind. As we drove to the vet, knowing that the outcome would not be good because of her condition, Rodney told me he felt she knew it was time to go. As he said it and as I held her paw, she took her left front paw and placed it over my hand, then looked me in the eye. She was letting me know it was OK. She truly was ready to go. We held her as she took her final breaths, petting her, reassuring her. She gave us much more comfort over the years than we could possibly have done in her final minutes. She protected us from intruders, cuddled with me on lonely nights and showed us love and happiness in all her romping and resting ways. With heavy hearts, we left her body at the vet to be cremated, and two days later, picked up the solid oak urn with an engraved plate that reads: Barkley Margison, 1992 to 2006, Forever in Our Hearts. A photo of her with Tyler adorns the front, reminding us of the happy pup she was. Although she is gone, we will forever be blessed because she loved us.